This article will explain the difference between suspending and deactivating your mobile device and help you decide which option is right for you. 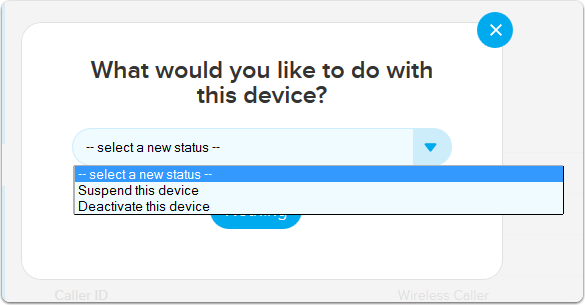 Then select Suspend this device or Deactivate this device from the drop down menu. NOTE: Deactivating your number means you are giving up ownership of that phone number. While you can reactive a CDMA device with a new number after deactivating, you cannot reactivate a GSM SIM card again; you need to purchase a new SIM card. 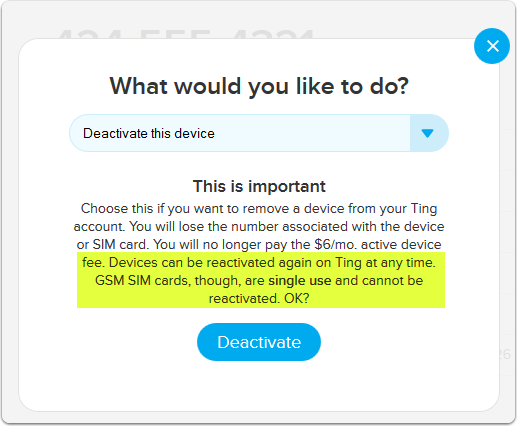 Since Ting's new numbers are randomly assigned, if you decide to reactivate a CDMA device, you wouldn't be getting your old number back. Note, reactivating your device with another number during the same billing period may result in a second active line fee as per our Terms of Service. Most of the situations in the "when NOT to deactivate" category are good reasons to suspend your device/phone number, but not to deactivate it. Currently, we do not offer an option to suspend Internet service.